Austrian Franz Klammer took home the Gold at the 1976 World Cup Race in Kitzbühel. The Hahnenkamm is a mountain in Austria, directly south of Kitzbühel, in the Kitzbühel Alps. The most famous slope on the Hahnenkamm is the classic downhill course, the Streif (streak, or stripe), which is regarded as the most demanding race course on the World Cup circuit. 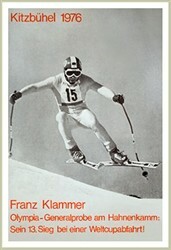 Also in 1976, Franz Klammer won the Gold Medal in Men’s Downhill at the Innsbruck Olympics. While skiing on the ‘edge of disaster’ Franz won by 0.33 seconds. This is one of the most famous Olympic Downhill Men’s Race as called by Bob Beattie, the men’s downhill coach at the time. 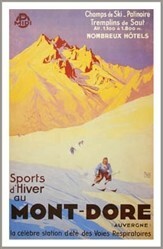 Throughout the race he frequently appeared completely out of control, often on just one ski. All were amazed that he actually made it to the bottom in one piece. Enjoy our YouTube video of this famous 1976 Olympic Medal race.